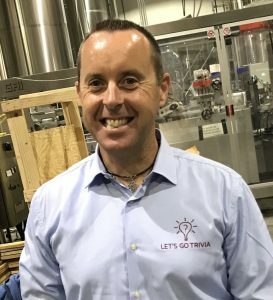 The idea for Let’s Go Trivia was born many many years ago when founder Garry Leavy would return home annually to his native Ireland for the holidays, and host a quiz on Christmas night in his parents kitchen for a few friends and his always-complaining-about-the-answers older brother. In 2013 whilst bartending in Gleason’s in Peekskill, Garry hosted a trivia night on Wednesdays while bartending (impressive, right!). It was a great success and Gleasons’ would be packed every week. Realizing that trivia can draw in a following every week, it was not until 2016 that Garry began pursuing other locations to see if his trivia could get the same result of a busy night. Very quickly his first location became a very busy Tuesday trivia. This soon turned into two locations, then suddenly it was five locations. At the end of 2017, Let’s Go Trivia runs 40 weekly events and the goal is to get to 200 locations by 2020! There’s no great story behind the name so we won’t make one up! Simply put, we needed a website domain name and every trivia name that we liked (New York Trivia, Tri-State Trivia, Empire Trivia) was taken. Garry simply had “Let’s Go Trivia” in his list of suggestions, and it was not already taken….and so the name quickly stuck. What is the format for playing Let’s Go Trivia? Let’s Go Trivia has a simple format. Five rounds with ten general knowledge questions in each round. One point for every correct answer. There’s a winning team for the first four rounds and an overall winner of course. If there’s a tie breaker on any round, we settle the tie breaker with a game of Rock em Sock em! Where can we find a Let’s Go Trivia location? If you click the “Events” link at the top of this page it will tell you all of the weekly Let’s Go Trivia events, their times and locations. We have year round Let’s Go Trivia leagues based on season. League play is ten weeks and we accumulate each team, at each locations points. The teams with the most points after 10 weeks will represent their Let’s Go Trivia location against the other Let’s Go Trivia locations in a final! Let’s Go Trivia carries general liability insurance.